I’m so excited to share this guest post by Kailey and Josianne of Educalme with you, all about how to start a mindfulness practice. They’ve broken it down into simple steps that make it easy for anyone who is wanting to start a mindfulness practice! They even share how practicing mindfulness has led them to simplify their homes and their lives and live more intentionally! I have been following Kailey and Josianne on Instagram for a while, and I absolutely LOVE what they do. They have a podcast and online programs showing teachers and parents how to bring mindfulness into their classrooms and homes. I have written about my own mindfulness and meditation practice several times before. And I love all the positive benefits it has added to my life. As well as how it has been a natural extension of embracing minimalism for me. Although Educalme’s podcast is primarily directed towards practicing mindfulness with kids, I have gotten so many valuable takeaways and insights from every episode, as a parent, and just for myself! The way they approach mindfulness is so practical, simple and fun, and I absolutely love what they share. Kailey and Josianne break down mindfulness as a practice, and as a lifestyle, in ways that make it easy to understand and add to your life. I can’t recommend their podcast and their mindfulness programs for kids enough! In the spring, I wanted to start a mindfulness practice with my kids, specifically my daughter, who experiences a lot of anxiety and stress, along with being a Highly Sensitive Person. Although I have a pretty solid meditation practice myself, I had no idea how to introduce my kids to mindfulness or meditation. The Educalme Family program was exactly what I was looking for. It’s a fun and easy way to practice mindfulness with kids. And has been a great way to connect as a family. Even my youngest, who just turned 4, joins us for our morning meditation! I figured if I was unsure how to start a mindfulness practice with kids, other people probably are too! 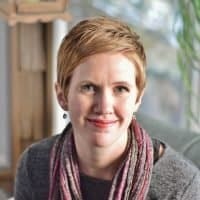 I approached Kailey and Josianne about writing a guest post discussing how to start a mindfulness practice with kids, and they graciously agreed! They have written a two-part series for us. Today’s post is all about how to start a mindfulness practice for yourself. Having your own practice not only benefits you but is also a great way to introduce mindfulness to your kids. Next week, I’ll be sharing part two of their series, all about how to start a mindfulness practice with your kids. Thank you Kailey & Josianne! I hope you enjoy this series. Having a mindfulness practice is a great way to bring more joy, gratitude and intention into your days. And I am so grateful to Kailey and Josianne for sharing their knowledge with us! Without further ado, here are Kailey and Josianne sharing how to start a mindfulness practice! We hear a lot about mindfulness these days and it can mean a lot of different things to different people. For us, mindfulness starts as a formal meditation practice. Then, what we learn during our daily mindful meditation naturally seeps into all areas of our lives. Our practice teaches us to be more self-aware, to notice how we really feel in our bodies. This translates into becoming more aware of how the foods we eat and the activities we spend our time doing really make us feel. We then have the awareness that allows us to choose the things that really make us feel good. Meditation teaches us to observe what is happening in the present moment. This translates to us slowing down and really appreciating the little moments with our families, our friends and in our work. Our daily mindfulness practice teaches us to observe our inner dialogue with openness and non-judgement. This allows us to become aware of any negative thought patterns we are stuck in so that we can compassionately choose better feeling, more loving thoughts. Mindfulness teaches us to tune in to our own inner voice and let the pressures placed on us by others melt away. This has helped us to follow our intuition even if it is guiding us away from societal norms. We have become aware that having too much stuff in our homes stresses us out. We would rather have more openness in our space and keep only the items and the clothing that really bring us joy. Meditation has many positive effects on us physically, mentally and emotionally and it has become our most cherished part of the day. When we practice daily, we see the effects extend far beyond the time we sit in silence. First, find a quiet spot where you can sit without disruptions. Put your phone on airplane mode and then set a timer for 5 minutes. And if 5 minutes seems too long, make it 2! Find a comfortable and alert seated position, and close your eyes. Focus all of your attention on your breath. Notice the feeling of your inhalation and your exhalation in as much detail as possible. If you would like to try a free guided mindfulness practice, we have one for you in our free resources section here. Be patient and compassionate with yourself as you begin this practice. Think of it as a fun experiment in studying your brain and its habitual thought patterns. You can’t be good or bad at meditation, it isn’t a competitive sport and you can’t win. If it’s hard to sit still, that’s ok! If your brain just won’t stop thinking, that’s ok too. And if your emotions seem to amplify in the silence, that’s fine too. There is no right or wrong experience to have during meditation. Observe whatever you experience during those couple of minutes of quiet time with curiosity and openness. The idea is to get to know yourself better. And to shine a light on the connection between the thoughts in your mind and the feelings those thoughts create in your body. One day you’ll catch yourself being less reactive in stressful situations. Or being able to keep your cool during high-pressure moments. You may feel more compassion towards yourself and others. And you will probably begin to appreciate the seemingly small moments of your life more fully and feel more gratitude in your day-to-day. A great way to form a new habit is to make it an integral part of your daily routine and to always practice at the same time and in the same place. After a couple weeks, you won’t even have to think about it. You will just naturally go through the steps of sitting in your meditation spot and setting your timer. We like to practice in the morning right after we brush our teeth. Now meditation is just part of our routine: wake up, brush teeth, meditate, get dressed, eat breakfast. Not meditating feels just as strange as leaving the house with morning breath! Remember that meditation is a time for you to practice feeling more love and joy and letting go of the thoughts and feelings that are clouding your natural state of wellbeing. Don’t make it another chore on your to-do list. Create a beautiful space for your practice. Use soft enjoyable music or diffuse essential oils to help make meditation your favorite time of the day. 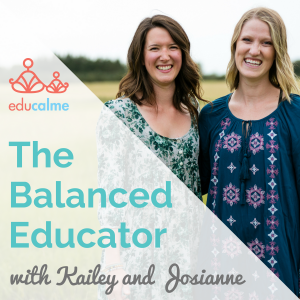 When finding a balance between their teaching careers and their personal lives became challenging, Kailey and Josianne found mindfulness. They discovered calm and joy from this practice and naturally began teaching mindfulness in their classrooms. The amazing transformation they saw in themselves and in their students led them to co-found Educalme. They create guided mindfulness practices and curriculum and co-host The Balanced Educator Podcast so that teachers and parents can easily learn and share mindfulness with their kiddos. I am loving this new addition to the simplify your life blog. I have been in to this mindfulness and change for the past 40yrs. So this is not new to me. But I am loving the different and modern concept of mindfulness. I am open to new challenges so will follow this blog with great interest. Mindful about trying to change and finding it difficult to discard old set patterns of thinking and behaviour. Many people grew up with great unhappiness and can’t help being negative. They knew nothing else. Don’t be discouraged. I was in my 40’s when I reached the end of my unhappiness and took myself off for counselling. Someone trained to come alongside me and explore my negative emotions. It is all about being TRANSPARENT. Now we can start to change. With a little help be it personal ONE TO ONE help. Wherever you find yourself it is never too late to change. I emerged with a NEW ME. I felt ALIVE for the first time in my life. Change became exciting. DISCOVERY. The lack of confidence that had dogged my life was no more. I started NURTURING myself in to becoming a New person with no more WOOLY THINKING. The help from counselling helped clear out the cobwebs I could not reach and find the Real Me. I felt so good I could have danced on air. Meditation comes easier. New ways of thinking is exciting. One relates better and we do become better people to be around. Using one’s Past as a platform for the future. Learning new things. New ways. New skills, for life. Seeing Life as an Adventure now. Even if you had a bad start in life you can use this as a springboard for change. Nothing in your life is wasted if you can use it more wisely in the present for a better future. Wow, thank you so much for sharing this with us Doreen. What a wonderful journey and transformation you have taken. I absolutely love your outlook and perspective. It’s very inspiring to read about how you’ve made the decision to make changes in your life, taken action and achieved wonderful results. Thank you again for sharing your experience with us, it was truly wonderful to read. Thanks for reading as always, I appreciate your support and sharing! I can’t wait to check out the podcast! The idea of introducing my children to mediation admittedly seems difficult. However, I know it could benefit my kiddos tremendously. I just discovered mediation this past year, and although I don’t do it regularly, it helped me through some stressful times. Yes, definitely check it out! I agree – introducing my kids to meditation and mindfulness seemed really difficult too. I had my own mindfulness and meditation practice but honestly had no idea how to translate it into something I could share with my kids. Educalme’s program makes it so easy though, it’s literally completely set up for you, all you have to do is sit down and push play! I agree – my meditation practice has helped me a lot too. I’m so happy I can help my kids gain some of those tools now too in a fun and easy way! Thanks for reading and I hope you enjoy their podcast!